Steps 1-3: start with 'old' hair or spritz on a little dry shampoo for some texture. scratch your head a bit to loosen up the hair from your scalp and (1) use your fingers to comb your hair up into a high ponytail. (2) use two fingers to loosen the hair around you hair line and tug free some fly away's for a more effortless look. holding the ponytail in your right hand, (3) pull a hair-tie over the hair with your left hand. Steps 4-6: (4) With your right pull the hair nearly all of the way through the hair-tie, but (5) leaving a few inches in. Twist the hair-tie once with your left hand, and (6) use your right to shove all the hair into a ball into your left hand. Steps 7-9: (7) Pull the hair-tie over the knot with your right hand (8) and release, and voilà! Now (9) use a couple bobby pins to secure the sides down a bit if you'd like, and spray with a little hairspray to finish up! As you can see I show the bun wrapped in a vine of faux flowers and also used a bandanna as a headband, but of course I wear it plain every day so you dress it up however you want:) Also remember that with the volume, that I can pull the bun apart and tug the hair out and have it stay looking so full because of the dry shampoo. It really adds a lot of good grip! I'm always here for any questions that you may have in trying out this or any of my styles, and thanks so much for visiting and reading! I think you have such beautiful hair, your hairstyle posts are so inspiring. Also, you have a lovely family. This looks so pretty! I absolutely love it! Seeing your festival hair posts really makes me want to grow my hair as long as yours. It's so beautiful! Oooo Lala! So pretty! 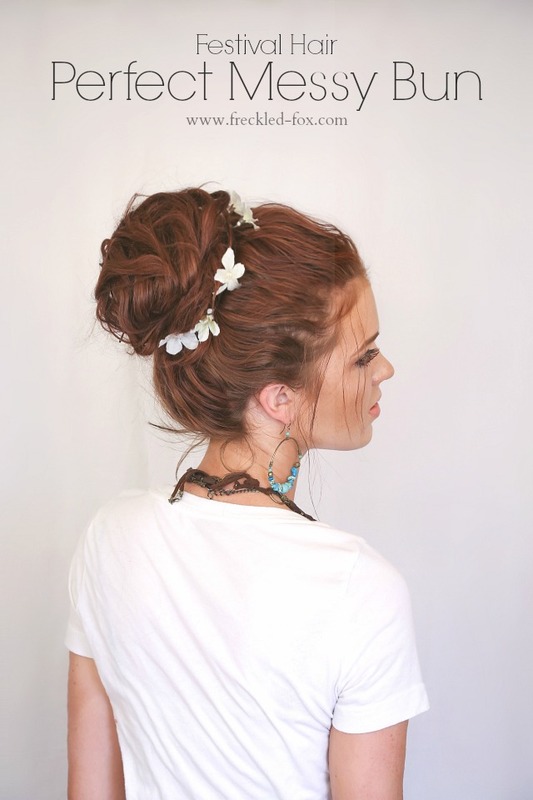 I love the messy bun, but you took it to a whole new chic messy bun level. I'm going to try this! Thank you for sharing! Do you use the colored batiste dry shampoo? I recently dyed my hair dark and my dry shampoo is really hard to rub in now! I do the same for my buns. But I have little hair who coming out of my messy bun. 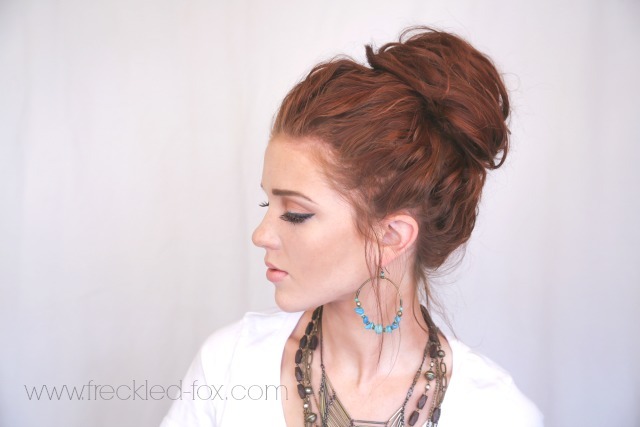 This is hands-down the best how-to I've ever read for a messy bun! I have very fine hair that usually makes a pitifully small bun. I followed your instructions here and, boom! The most beautiful bun of my life. I even took pictures and sent them to my mom and sis! Where did you get those adorable flowers you put in your bun? Are the secured? 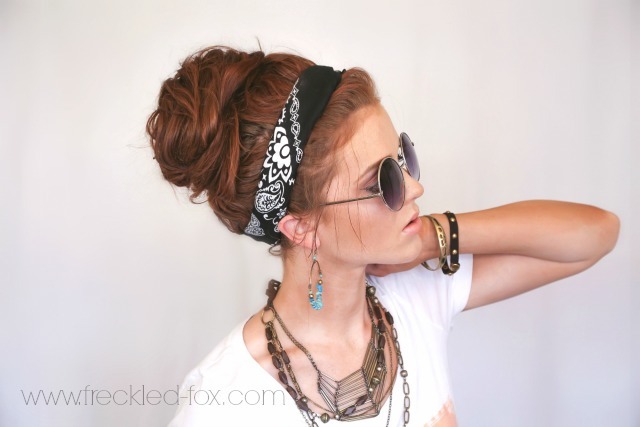 Wich my hair was this thick so it looked so good in a bun like yours!! Where did you get the adorable flowers you put in your bun? Thank you! I have very long hair and this is the first tutorial I've found that works for me. Thanks again!